Hands. Hands can be instrumental in a photo – they emphasis, they hide, they reveal. They can be the star of the show, or just a prop to help the main attraction stand out better. 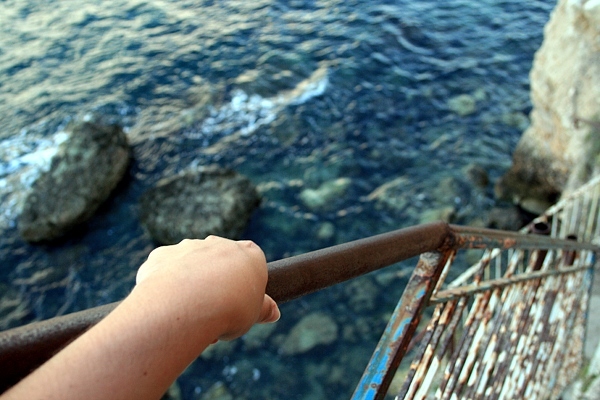 In this photo, this hand was what kept me between life and death as I walked down a rickety metal staircase on the side of a cliff down to the beach. I was glad for that hand and I’m glad I captured the moment, too. Share a picture that has a HAND in it with everyone! I love your blog! I think it’s awesome that you have your whole family involved. Great dad! Nice theme. Hands make an evocative subject for photography. My entry is accompanied by an excerpt from one of my favourite poems. My entry… Have a great weekend! Another entry under thirdeyemom will be coming up soon! Here is my first entry for the challenge! Do leave your reply! Beautiful hands of a true artist! Here is my second entry! Please leave your valuable comments! 153 Responses While this challenge is closed to new entries, we encourage you to visit the Reader to find other avid bloggers. That Sill Light. Catch that Light! MindBlur Am so thankful for wonderful hands!! !